Being from the Bay Area has its advantages. Having built our business meeting the demands of the world’s most innovative and successful companies, there are few creative or logistical problems that we can’t solve or overcome. Try us. We’d be happy to help you too. The typical commercial graphics production project has multiple moving parts and steps. With a full professional design, production, delivery and installation capability, BarkerBlue eliminates the need to stress your in-house resources or go to several outside vendors for help, allowing you to complete your project with just one call. The budget should never stand in the way of quality, and, regardless of how much you have to spend, we find a way to use the highest quality materials and consumables possible. That plus our multi-step QC process and state-of-art production facility ensures every deliverable meets your exacting standard of quality and performance. We understand the importance of your graphic project to your business and utilize an agency service model that puts a dedicated account manager and team at your disposal from start to finish. With experience in every facet of the production process, our managers add value at every step and ensure your project is delivered exactly as you envisioned it. BarkerBlue helped us allow for our employees to engage with our corporate values and bring the culture to life within our organization. 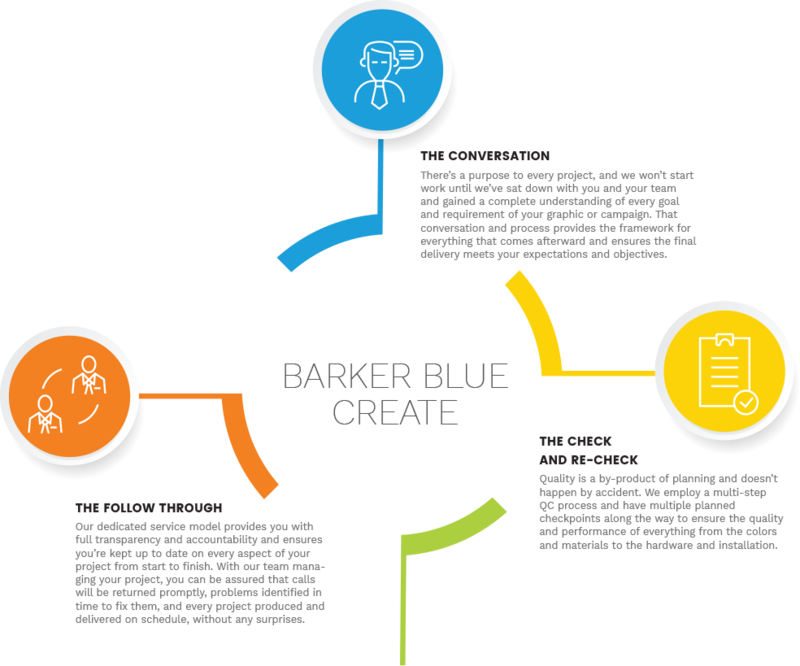 BarkerBlue was a critical partner in not only thinking through the best way to do this, but also in creating and developing the beautiful design, the color scheme, and how the graphics are presented on the walls. We look forward to continue our partnership as we continue to grow.